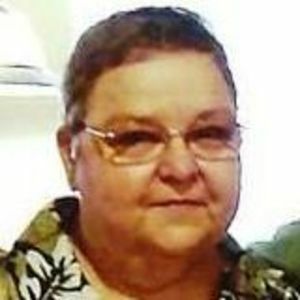 MOORMAN – Gelita Ray Ashby, 65, of Moorman, died Monday, May 1, 2017, at 11:25PM at Owensboro Health Muhlenberg Community Hospital. Mrs. Ashby was born October 11, 1951, in Muhlenberg County. She was secretary at Geary Bros. Logging, and had also held several different positions at the Executive Inn in Owensboro. She enjoyed spending time with her family, was a member of New Hope Missionary Baptist Church. She was preceded in death by her father, Willard Geary; mother Dee Geary; brothers Bobby Geary and Wilson Geary; and sister May Geary. She is survived by her husband, James "Jimmy" Ashby; brothers Freddie (Sue) Geary, Edward (Brenda) Geary, and Billy Geary, all of Moorman; and sister Kaye (Steve) Flener of South Carrollton. Funeral services will be Friday, May 5, 2017, at 11:00AM at Tucker Funeral Home in Central City. Burial in New Hope Cemetery. Visitation will be Thursday after 5:00PM at the funeral home. Online condolences may be made at www.tuckerfuneralhomes.com. The beautiful and interactive Eternal Tribute tells Gelita's life story the way it deserves to be told in words, pictures and video. I just got the word of Gelita's passing. I was telling someone last week about playing softball for the Moorman team when I was 18. Gelita and Sue coached and we had a really good team. Those were some of the funniest times of my life. I can still see Gelita laughing and smiling. And telling me "now you hit that ball". I smile every time I think of her. She was a wonderful person to all that knew her. So sorry to hear of Gelita's passing. I have many great memories of playing softball and with Gelita coaching. Wonderful memories. You will be missed. I smile every time I think of Gelita and all the memories we made on 2nd and 3 shifts at Executive Inn. She was a true friend and will be missed by all that knew her and loved her. I remember I used to play softball with Gelita and some of the other girls around here for many years. What I remember most is that no matter how big or small the game was she never got excited, mad or upset whether we were winning or losing. She was truly a sweet lady and seemed to treat you the same anytime she saw you. She will be missed and thought about often. My prayers and thoughts go out to the family and to Jimmy "Be strong and keep on fishing and when you watch a ballgame know that she is watching too. Gelita was one of a kind, always friendly and had something nice to say about everyone. She was one of the people that will always be remembered for her willingness to reach out to each and every person. I am blessed that on this journey called life our paths crossed. Gelita is a beautiful soul who will always be in my heart. I am thankful to have had the opportunity to be in her prayers and enjoy her kind inspiring words. I would like to express my deepest condolences to her family. Oh I am so saddened by this news. My thoughts and prayers go out to my old softball friends and their families. Rest in Peace dear Gelita. I am so sorry to hear of Gelita's passing. God certainly got a gem. She was a wonderful person and I always enjoyed talking to her. I worked at Advance Therapy Innovations in Owensboro. I looked forward to seeing her everytime she came in. She always had a smile on her face and a very positive person. I will always have think of her whenever I see the Womens Tenn basketball team. RIP sweet lady. I am so sorry to hear about Gelita's passing. My thoughts and prayers are with James and her family. Everytime I see the Tenn. girls basketball team I will always think of her. She was such a sweetheart and a joy to talk to. She always had a smile on her face. God certainly got a gem. RIP. I worked with Gelita at the Executive Inn and loved her dearly. I think of her often, and so many of the lessons I've taken to heart in my working life came from her. My heart is with her family today. So sorry for your loss.